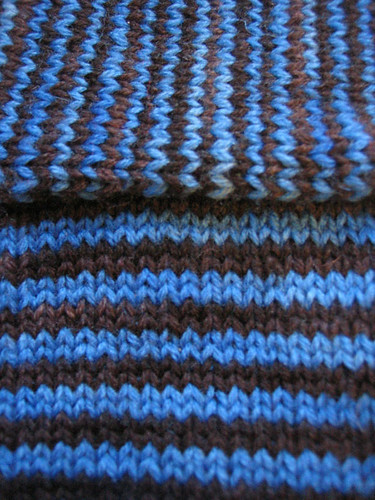 I’m currently designing this sweater… (well, I guess it’s only a sleeve and a half so far.. hardly qualifies as a sweater)… which is going to be pretty stripey all over. It’s knit from recycled and hand-dyed merino yarn, and it’s at a pretty fine gauge, knit on US#3 (3mm) needles. As the same needles are being used for gloves that I’m currently knitting, I have had to wait before getting back to the sweater. Of course, I’m impatient, because who doesn’t love stockinette in the round with only stripes to distract one from cheesy TV?! 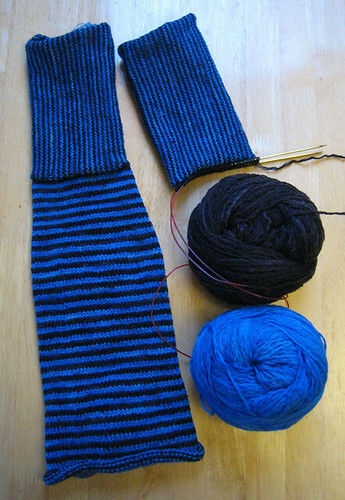 And I think the end product will be very wearable – that is if I ever finish it! !